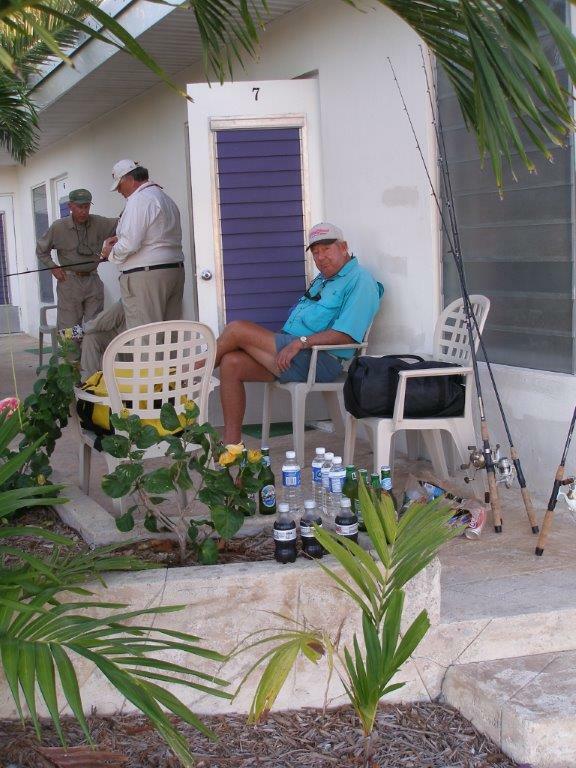 Lee Mitchell waiting for the guides at the Siesta Motel in Marathon, Florida. Fishing buddies Chuck Sheley and Rich Mealey sabotaging gear in the background! Fishermen love stories. Love to hear them and love to tell them. Mitchie, known to most as Lee Mitchell, was my Lake Erie buddy –you know- the generous guy with the boat who lets his buddies tag along. While we fished for Lake Erie perch and walleye, Mitchie loved to tell stories about fishing the flats of the Florida Keys. Stories of impossible to catch permit in slick calm Key West channels and schools of tailing and waking bonefish arriving in Bonefish Alley on an incoming tide at sunset. In March of 1988, Mitchie was responsible for booking my first flats trip – a half day charter out of Marathon with the late Jose Wejebe as our guide. I will never forget that first Boot Key bonefish when José whispered “School of bones – 70 feet – nine o’clock”. I checked three o’clock. José urged me to check the other side of the boat. I saw nothing but launched a shrimp anyway. As luck would have it, I hooked and caught a six pound bonefish. I was elated. Mitchie was happier! He is that kind of friend. The fishing continued the next day with Steve Huff as our guide. We headed across choppy Northwest Channel to the Marquesas Islands. The Marquesas yielded Mitchie a beautiful permit. We had many shots at permit and Mitchie insisted I take all the casts after the first fish had been caught. Even though I did not hook a permit, the flats had hooked me! Over the last 24 years, Mitchie has treated me to snook, redfish and tarpon fishing in the Everglades on his own skiff. He organized our annual trip to the Florida Keys during which we fished with close friends and learned to love and respect the bonefish, permit and tarpon of the flats. Mitchie has introduced me to the best flats guides of the Keys – Steve Huff, Dustin Huff, Dale Perez, Harry Spear, Jose Wejebe, Nat Ragland, and Ray Fetcher. These men became my fishing mentors and friends. Most importantly, we made memories. Mitchie, thanks for making me a lifetime Florida Sportsman! This entry was posted in Fishing Stories and tagged Bonefish, Fishing friend, Florida Keys, Jose Wejebe, Lee Mitchell, Steve Huff by Tarpon Slam. Bookmark the permalink. Very sure. I am irritated that Florida Sportsman did not publish it!